The votes are in! See which places you chose as your favorites from our list of 40 of the most important, most interesting, and quirkiest American places 40 years old or less. Welcome to 40 Under 40: Places—40 of the most important, most interesting, and quirkiest American places less than 40 years old, compiled by the staff of Preservation magazine. The by-no-means comprehensive list includes sites both well-known and obscure, high-end and low-budget, and urban and rural. Places typically aren’t considered historic until they’ve been around for at least 50 years, so why highlight younger sites now? Because by looking at them through a preservation lens and identifying places worthy of saving BEFORE they become truly historic, we can be proactive about their futures. Each place on our list was built in 1978 or later, and each makes an important contribution in one of six categories: Arts, Science and Tech, Culture, History, Landscape, and Housing. We’ll be rolling out our 40 Under 40 Places stories, category by category, through the end of 2018, and a public online voting period will take place from January 7-18, 2019. Top vote-getters will be featured in the Spring 2019 issue of Preservation. Read on to see if any of your favorite places made our list—and please vote for your top choices in January! Here are the seven places on our list from the Arts category. 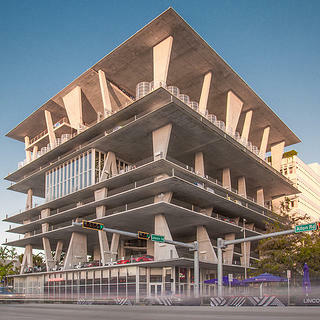 The parking garage at 1111 Lincoln Road in Miami Beach is more than just a place to park your car. It’s also a place to shop, work, live, and even get married. It’s been used for concerts, fashion shows, photo shoots, and yoga classes. Some even use it as a lookout point, clambering to the upper levels take in panoramic views of the city and the ocean. It’s that rare parking garage that’s a destination unto itself. It was the vision of developer Robert Wennett, who, in 2005, purchased a 1960s SunTrust Bank building that came with an adjacent parking lot in the hopes of revitalizing that stretch of Miami’s Lincoln Road Mall—an outdoor shopping, dining, and entertainment district. He selected Swiss architecture firm Herzog & de Meuron to carry out his plan. The firm designed the concrete, open-air structure, which opened in 2010, with 40,000 square feet of retail space, 110,000 square feet of office space, a rooftop penthouse, and enough parking for nearly 300 cars. Its seven levels are of varying heights, to accommodate its varying uses. A sculptural, open staircase winds through the center. And with no exterior walls, the space gets plenty of natural light and fresh air—qualities rarely associated with a parking garage. Fun Fact: The parking garage has no exterior walls. Industrial-strength cables help keep cars from toppling over the ledge. There’s already an element of magic to a sunrise or a sunset. Add an LED-light sequence and a pavilion that seemingly floats above a grass-covered pyramid, and you have something transcendent. That’s the experience American artist James Turrell created in his Twilight Epiphany Skyspace at the Suzanne Deal Booth Centennial Pavilion at Rice University in Houston. Built in 2012, this is Turrell’s 73rd Skyspace, the name he’s given to his architectural installations, all of which include an aperture in the ceiling that opens to the sky. And it’s one of his largest in the world. The pavilion—made of grass, concrete, stone, and steel—accommodates 120 people on two different levels. Slanted stone benches line the perimeter to allow observers to lean back and look up through the 14-by-14-foot opening in the ceiling. It’s enough of an experience to sit and study the sky in this way. But twice a day at Twilight Epiphany, at sunrise and sunset, a light sequence is projected onto the roof, creating a light show that changes along with the changing sky. Technology merges with nature to a spellbinding effect. The show lasts approximately 40 minutes. Twilight Epiphany is the first Skyspace that was engineered for acoustics to accommodate both live performances and electronic music, with speakers and subwoofers expertly hidden in the walls and under the benches. As such, it functions as a laboratory for the university’s music students. Hours: Wednesday through Monday, 6 a.m. to 10 p.m.
Fun Fact: The roof of the Skyspace measures less than 1 inch thick. The Quadracci Pavilion at the Milwaukee Art Museum appears poised to take flight over Lake Michigan. After all, it has wings. And those wings, which actually are a movable sunscreen called the Burke Brise Soleil, open each day at 10 a.m., flap at noon, and close when the museum closes (all weather permitting). But despite its impressive 217-foot wingspan, the pavilion remains grounded. 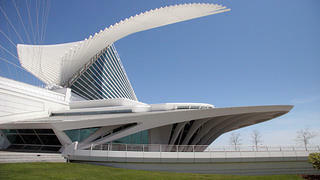 Spanish architect Santiago Calatrava designed this innovative addition to the Milwaukee Art Museum, which was completed in 2001. And the 90-ton Burke Brise Soleil is just one of its standout features. There’s also the cathedral-like Windhover Hall, a reception hall with flying buttresses; ribbed vaults; a vaulted, 90-foot-high glass ceiling; and marble floor. Two arched promenades, the Baumgartner Galleria and Schroeder Galleria, extend off this hall, offering visitors views of the lake and downtown, respectively. And the Reiman Bridge, a pedestrian suspension bridge that spans Lincoln Memorial Drive, connects the museum to the city. The Quadracci Pavilion joins the museum’s other two buildings: the Eero Saarinen–designed War Memorial Center, completed in 1957, and the David Kahler–designed addition (1975). More than 400,000 visitors each year flock to the city’s oldest museum to see the nearly 30,000 objects in its collection. Hours: Tuesday, Wednesday, Friday, Saturday, Sunday, 10:00 a.m. to 5:00 p.m.; Thursday, 10:00 a.m. to 8:00 p.m.
Fun Fact: The Burke Brise Soleil has a wingspan similar to that of a Boeing 747-400, and has two ultrasonic wind sensors that automatically close the wings if the wind speed reaches 23 mph or greater. 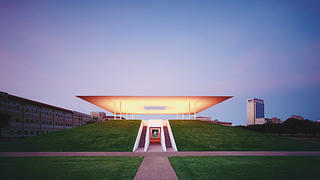 Glass, concrete, steel—the Modern Art Museum of Fort Worth is made of simple materials, but its design is anything but. 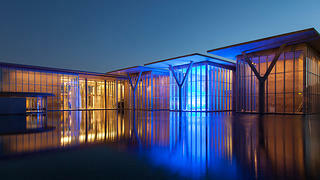 Architect Tadao Ando created a truly modern museum space that appears to float atop a reflecting pond on 11 acres of flat, northern Texas land. There are expansive walls of glass, cantilevered cast-concrete roofs atop five pavilions, and a system of skylights and clerestory windows that fill the gallery space with natural light. A lofty lobby and a series of staircases and concrete-walled passageways lead to the various galleries, the restaurant, and the terrace and gardens outside. Chartered in 1892 as the Fort Worth Public Library and Art Gallery, the museum underwent several name changes before it became known as the Modern Art Museum of Fort Worth—or simply, the Modern—in 1987. Its new home in Fort Worth’s Cultural District opened on December 14, 2002. All told, it contains 53,000 square feet of gallery space, a 5,600-square-foot education center, and a state-of-the-art auditorium. The Modern houses nearly 3,000 objects, including paintings, sculptures, videos, and photographs, and showcases work by artists like Jackson Pollock, Andy Warhol, Francis Bacon, and Cindy Sherman. Hours: Tuesday, 10:00 a.m. to 7:00 p.m.; Wednesday, Thursday, Saturday, and Sunday, 10:00 a.m. to 5:00 p.m.; Friday 10:00 a.m. to 8:00 p.m.
Fun Fact: The Modern is in good company: It stands opposite the Louis Kahn-designed Kimbell Art Museum in Fort Worth’s Cultural District and near the Amon Carter Museum, designed by Philip Johnson. Tucked deep in the woods just outside Eureka Springs, Arkansas, Thorncrown Chapel looks simultaneously like it grew straight out of the earth and was dropped down from somewhere otherworldly. The wooden chapel rises 48 feet high and is made almost entirely of organic materials, with 425 windows, more than 6,000 square feet of glass, a central skylight, a rock wall, and 100 tons of native stone and colored flagstone as its base. 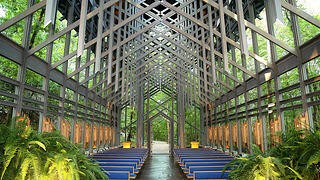 The chapel’s elaborate trusses are made of local pine and, together with the surrounding trees, create a constantly changing pattern of light, shadows, and reflections throughout the space. This peaceful, wooded respite was the vision of Jim Reed, a Pine Bluff, Arkansas, native who purchased the land where the chapel now sits in 1971 to build his retirement home. After noticing his land was a popular lookout point for views of the Ozark hills, he decided to build a majestic glass chapel there, giving people a place to sit and find peace. Since opening on July 10, 1980, Thorncrown Chapel has welcomed nearly 6 million visitors. It offers Sunday worship services and is available to rent for special events. Fun Fact: The name “Thorncrown” came from Jones and his wife. They made two lists of biblical words and would randomly select one word from each list and pair them together. “Thorn” and “crown” proved to be the winning pair. When the Walt Disney Concert Hall opened in October 2003, Los Angeles instantly gained a new landmark. The brushed stainless-steel facade soars, bends, dips, and dives from its perch at the top of Bunker Hill, where it occupies a full city block and serves as an unmistakable beacon of the city’s vibrant cultural and social scene. The concert hall was made possible by a $50 million gift in 1987 from Lillian B. Disney, in honor of her late husband, Walt Disney. She stipulated that the concert hall must be “one of the finest in the world,” and architect Frank Gehry was selected to meet that directive. Gehry’s design doesn’t just impress from the sidewalk. The interior continues to strike awe, as well. Its lobby is flooded with natural light, its walls are lined with rich Douglas fir, and inside the 2,265-seat auditorium is a stage made of Alaskan yellow cedar. It’s also an acoustical marvel. 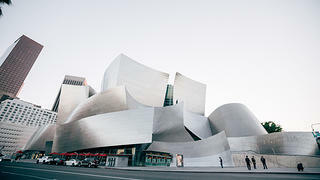 Gehry worked with Japanese acoustician Yasuhisa Toyota and the then-director of the Los Angeles Philharmonic, Esa-Pekka Salonen, to create a music hall that also functions as an instrument of the orchestra. The Walt Disney Concert Hall was designed to be the home of the Los Angeles Philharmonic and the Los Angeles Master Chorale. But Gehry’s insistence on designing what he called “a living room for the city” ensures that everyone feels at home there. Hours: The box office is open Tuesday through Sunday, 12:00 p.m. to 6:00 p.m.
Fun Fact: Gehry also designed the 6,134-pipe organ above the rear of the stage, working with Los Angeles organ designer and builder Manuel J. Rosales. Its external pipes are often referred to as “French fries,” given their resemblance to the salty snack. The late developer and preservationist Tony Goldman could have been content to leave the walls of the warehouses in Miami’s Wynwood neighborhood blank. He could have filled the buildings with restaurants or shops and left it at that. Instead, Goldman had a vision: He would turn these warehouse walls into giant canvases, inviting street artists from around the world to transform the windowless surfaces into something beautiful, while elevating street art (a genre he felt was unappreciated), in the process. 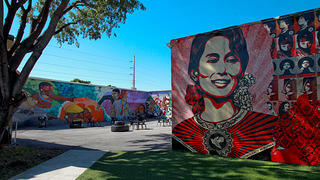 Wynwood Walls officially launched during Art Basel in 2009, and in its first year, it was co-curated by noted gallerist Jeffery Deitch. Since then, the site has welcomed dozens of artists from 16 different countries to paint more than 80,000 square feet of walls. And new murals pop up regularly. Participating artists have included some of the most acclaimed names in street art, including Shepard Fairey, Ryan McGinness, Swoon, and Faile. Their work is all large-scale and vibrant, bringing an indisputable energy to the area. Behind the painted walls, the warehouses do house restaurants and shops. But the main attraction to Wynwood are the walls, themselves, which function as an outdoor gallery—drawing pedestrians to the area to explore a historic neighborhood, learn about art, and, of course, take selfies. Hours: Monday through Thursday, 10:30 a.m. to 11:30 p.m.; Friday and Saturday, 10:30 a.m. to midnight; Sunday, 10:30 a.m. to 8:00 p.m.
Fun Fact: Goldman’s development company, Goldman Properties, released Wynwood Walls and Doors, a book about Wynwood Walls in 2010, with an updated version published in 2012.